Objective behavioural outcome data were used from monthly immunochemical faecal occult blood test (iFOBT) invites and returns over the previous 2½ years, compared with those during and after the campaign period. Adjustment for seasonality and the potential influence of other campaigns, as well examination of the duration of effects. Lack of a completely unexposed comparison state, however able to compare effects of higher versus lower campaign intensity across entire state populations. Examined overall campaign effects, rather than for demographic subgroups. Campaign effects reported are likely to be conservative, as we examined effects only among those invited in the current or past 3 months, not those invited earlier, and not among those who may have accessed screening ‘outside’ of the programme (eg, purchasing iFOBT from pharmacy or obtaining a script from general practitioner for non-National Bowel Cancer Screening Program iFOBT or colonoscopy). Unfortunately participation in the NBCSP among the Australian population has been disappointing, with only 40.9% of those invited taking up the opportunity to be screened by the programme.7 Lack of awareness of bowel cancer and the benefits of screening have been found to contribute to poorer screening rates, including among those invited to participate in the NBCSP.7 8 Of those strategies trialled in Australia and elsewhere to improve screening rates, there is strong evidence for the important role of primary care practitioners’ recommendations to undergo screening in determining whether a patient is screened.9 Using media education (postcards, letters) within primary care and enhancing primary care practice electronic medical records to include reminder systems can also improve screening rates.10 Outside primary care, culturally adapted group education sessions and multicomponent interventions (such as education sessions, videos and special events) have been found to increase screening rates,11 while telephone outreach modestly increases screening.12 Financial support and one-on-one education have been found to be less effective than group education.11 As the delivery of each of these interventions relies on practitioner, community or cultural group initiatives, they are likely to have limited population reach and so are limited in their capacity to drive increases in the overall population screening rate. Research into the effectiveness of mass media in changing other health behaviours has shown that success is closely tied to the extent and timing of exposure, with time-limited effects for ‘one-off’ campaigns and less impact if there is low message repetition and narrow population exposure.16 Nonetheless, these studies have shown that small effects can lead to substantial impact on population behavioural change due to exposing many individuals within a population. Consistent with this, a recent study found that specialist referrals increased following a one-off 7-week television-led bowel cancer detection campaign in the UK, and that the increase lasted for 3 months postcampaign.17 18 Illustrating the importance of the extent of population exposure, another study found that as past year exposure to screening information increased from news media and the television-led ‘Screen for Life’ campaign, levels of screening participation rose.19 One non-televised medical practice based campaign in the UK (leaflets, DVDs, posters, bookmarks along with practice reminder letters and health professional education materials) was found to increase health professional visits and referrals to FOBT, flexible sigmoidoscopy or colonoscopy, but not more so than the comparison group that implemented only the practice reminder letters and health professional education.20 Another non-televised campaign in the USA relying on billboards, posters and articles sent to local newspapers, and brochures and posters in clinics produced no differences in bowel cancer screening rates among those in counties exposed to it compared with those in control counties.21 The limited effect of these campaigns is likely due to the low population reach of these types of non-televised campaign elements. As there had been very few widespread Australian television-led mass media campaigns to promote the NBCSP and use of FOBT kits mailed to eligible people’s homes, Cancer Council Australia (CCA) launched a mass media campaign in mid-2014. The campaign included a 30 second television commercial (TVC) which aired in three Australian states: all of Queensland, metropolitan Adelaide in South Australia and regional Victoria. Other supportive elements of the campaign had national exposure, including a print, digital and online strategy (full-page print advertisement in Prevention magazine; internet search optimisation; native digital content advertising; digital video advertising; website sponsorship) and 4 minute televised editorial segments on morning show programmes. The primary campaign objective was to increase the number of people aged 50–74 who completed an NBCSP FOBT. This study aims to identify if NBCSP FOBT completion and return rates increased during and after the CCA bowel cancer screening mass media campaign and the extent to which the higher intensity paid television advertisements led to higher screening rates. This will be achieved by comparing the rate of FOBT completion over the 2½-year period prior to the campaign with rates during and after the campaign. The impact of campaign intensity will be examined by comparing return rates over time in the state with complete exposure to all of the campaign elements including paid 30-second television advertising (Queensland) with a comparison state (Western Australia, WA) that was only exposed to the lower intensity supportive elements (see following link for interactive map of the states and territories of Australia: https://en.wikipedia.org/wiki/States_and_territories_of_Australia). The NBCSP has had a gradual introduction (table 1), with full implementation as a 2 yearly programme to be complete by 2020. The test used by the NBCSP is an immunochemical test requiring the collection of two samples, which is a non-invasive test that can detect microscopic amounts of blood in a bowel motion, which might indicate a bowel abnormality, such as a polyp, an adenoma or cancer. Once fully implemented, eligible Australians will be sent an iFOBT screening kit and invited to screen every 2 years between their 50th and 74th birthdays. More information about eligibility is available at: http://www.cancerscreening.gov.au/internet/screening/publishing.nsf/Content/bowel-campaign-home. De-identified NBCSP monthly data from 1 January 2012 to 31 December 2014 from Queensland and WA were obtained. The data included the number of NBCSP invitations sent out and the number of NBCSP kits returned for analysis within each month and state. At the campaign development and refinement stage (October 2013), potential NBCSP eligible members of the public were consulted through a series of focus groups (four groups of people aged 50–54 years and four groups of people aged 55–65 years across metropolitan and regional areas). These groups were shown the campaign materials and responded to these through a guided discussion. They discussed perceived salience and relevance of the message, message understanding and perceived credibility and likely impact on behavioural change. A number of additions and refinements were made to the campaign materials in response to this feedback. Patients were not involved in the design or conduct of the study as this research involved secondary analysis of real-world data collected by the NBCSP. We completed a standard data request for the invite and kit return data for this study from the Australian Government Institute of Health and Welfare (https://www.aihw.gov.au/our-services/data-on-request). In the NBCSP information booklet that is sent to participants with the FOBT kit, it stated, ‘Your personal details will be used to: monitor and evaluate the effectiveness of the program and its impact on the incidence of bowel cancer.’ This information booklet also detailed how participants can opt out of the NBCSP if they would like to. The data quality statement for the NBCSP can be found at http://meteor.aihw.gov.au/content/index.phtml/itemId/668817. The mass media campaign, run by CCA with Australian government funding, aimed to increase awareness of the preventability of bowel cancer when detected early and to encourage adults aged 50–74 years to participate in the NBCSP when invited. The proposed creative concepts went through extensive qualitative developmental testing to ensure that they were relevant and likely to be effective with the target audience.22 A 30-second TVC featured real people who prematurely lost loved ones to bowel cancer reflecting on how much they missed them and how preventable bowel cancer is if detected early. The TVC informed people that ‘Bowel cancer kills 75 Australians every week’, that ‘If detected early, 90% of bowel cancers are cured’ and asked ‘Are you 50 or over? Do the test. It could save your life’. The TVC closed by encouraging people to visit a campaign microsite (bowelcancer.org.au) and Cancer Council Helpline11 13 20 to find out more. The TVC aired from 1 June to 26 July 2014 and was estimated by media buyers to reach around three-quarters of the target audience approximately 10–11 times.23 It was broadcast on Channel Seven, the most popular free-to-air Australian network channel, across the entire state of Queensland. It was also released nationally as a Community Service Announcement and achieved approximately $AU40 000 in bonus airtime nationally from the Seven Network. A 4-minute televised advertorial (ie, an interview segment within a morning show TV programme) was also broadcast nationally, being shown 21 times (in The Morning Show and The Daily Edition, which had high potential audience reach among 50+ years old). A full-page advertisement and editorial coverage were included in the July edition of Prevention magazine, which also had good potential audience reach among 50+ year olds. General practitioners (GPs) were also targeted with advertisements in the Medical Journal of Australia and Australian Family Physician. Finally, the campaign included online promotion using Google Adwords search, YouTube, TrueView video, Digital native advertising, multichannel network partnership and Yahoo!7 Display/Video. Our outcome measure was the number of FOBT kits returned to the NBCSP for analysis per month. This outcome showed no evidence of autocorrelation, however, it was overdispersed (mean=5234; variance=5 769 399) and so negative binomial regression was used in preference to Poisson regression. The pattern of the data was examined in preliminary analyses to examine if there was any seasonality. This examination revealed a lower number of kits were returned for analysis during each January to February, due to the lower number of invitations that were sent out during the summer high temperature months (ie, from December to February). In addition, higher numbers of kits were returned for analysis around May, October, November and December each year, due to greater numbers of invitations sent out in March, April, September, October and November each year to compensate for lower numbers in the high temperature months (figures 1 and 2). 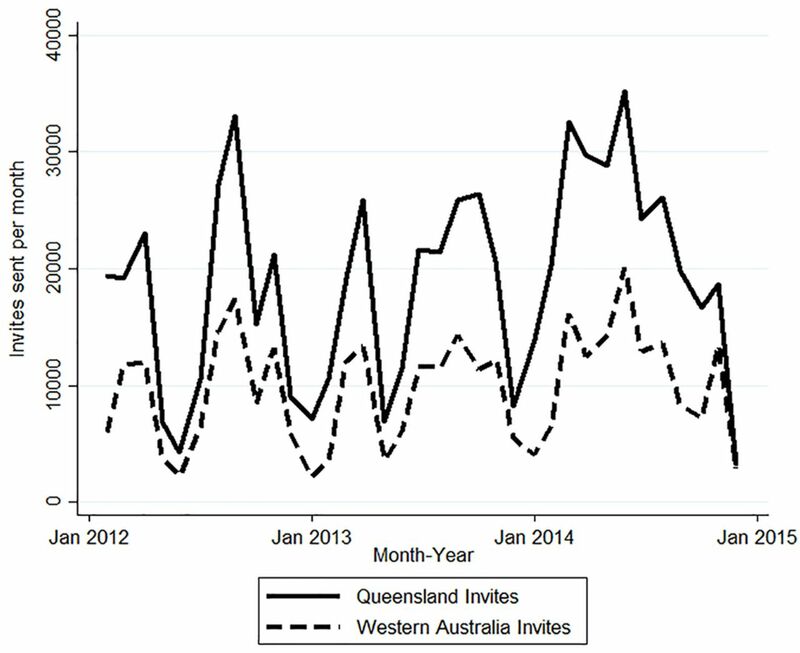 Monthly number of invitations sent, January 2012 to December 2014, by state. Monthly number of kits returned and analysed, January 2012 to December 2014, by state. The Jodi Lee Foundation also funded a separate television-led bowel cancer screening campaign with additional online and news supportive media in September 2014 in metropolitan and rural Queensland and metropolitan WA. An indicator variable was constructed to denote when that campaign was on air and for 2 months after it aired (September to November 2014), so it could be included in analyses as a covariate. We constructed a bivariate variable to denote when the CCA campaign was on air plus 2 months after the end of the broadcast period (ie, ‘0’ for non-campaign months (used as the reference) and ‘1’ for June, July, August, September 2014). Previous research has indicated the effects of behavioural change campaigns may last for up to 2–3 months after broadcast ends.24–26 We limited the potential effect of the CCA campaign to only 2 months postbroadcast to avoid substantial overlap with the Jodi Lee campaign that began in mid-September 2014. Seasonally adjusted models were run, with additional adjustment for the month associated with the Jodi Lee campaign and the 2 months after that campaign went off air (September to November 2014). The first set of negative binomial models examined the overall effect of the CCA campaign in Queensland and WA together (including a state indicator as a covariate). 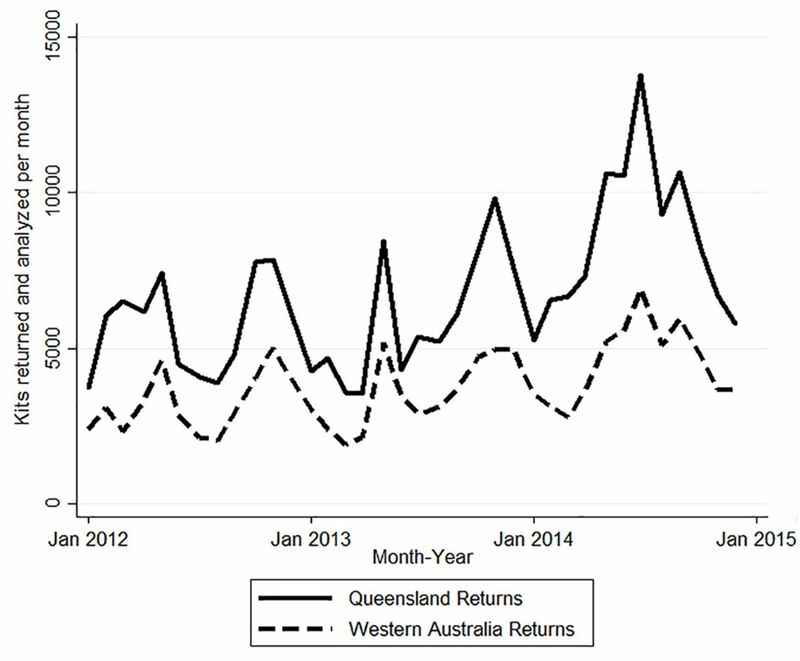 The second set of models examined whether there was an interaction between state and campaign, with subsequent models categorising the state and campaign period separately (1=WA, non-campaign months; 2=WA, campaign months; 3=QLD, non-campaign months; 4=QLD, campaign months), to examine state-specific return rates and rate ratios. Sensitivity analyses examined effects of specifying the duration of CCA campaign effect as lasting up to 1 month after broadcast, instead of up to 2 months after broadcast. Examination of the duration of effects beyond 2 months was not possible due to overlap with the Jodi Lee campaign. Over both Queensland and WA, the CCA campaign was associated with an increase in the number of returned kits among those invited in the current and past 3 months (Rate Ratio (RR) 1.15, 95% CI 1.05 to 1.27, p<0.01). The seasonally adjusted average number of monthly kits returned and analysed during non-CCA campaign months were 6631 in QLD and 3805 in WA and during CCA campaign months were 7945 in QLD and 4213 in WA. As table 2 shows, the rate of kits returned for analysis increased by 20% in Queensland during the months of the national CCA campaign and up to 2 months after broadcast, but only showed a tendency to increase in WA (11%, p=0.087). Given the similar direction of movement (although non-significant in WA), there was no indication of an interaction between state and the CCA campaign (X2=1.07, p=0.300) and there was no significant difference between the Queensland and WA increase in rate of change (RR-difference 1.08, 95% CI 0.93 to 1.26, p=0.300). The sensitivity analyses examining the length of campaign effects indicated that the overall campaign effect was non-significant when configured to last for only 1 month after broadcast (IRR 1.10, 95% CI 0.99 to 1.22, p=0.062), however, the effect for Queensland was significant by then (IRR 1.15, 95% CI 1.00 to 1.33, p=0.046). Compared with non-campaign months, the television-led CCA campaign was found to increase the numbers of age-eligible people returning their NBCSP kits for analysis by 15% across these two Australian states, and by 20% in Queensland where the paid television advertisements were broadcast. This increase occurred during the months of the campaign and for 2 months following the end of the campaign. The findings of this study build on previous research that has indicated bowel cancer screening campaigns can increase bowel cancer screening rates.11 The higher intensity campaign that included the paid television advertisement in Queensland that reached around 75% of the target audience approximately 10–11 times, plus the supportive media (ie, 21 4-minute advertorials, plus digital media) generated a substantial increase in the rate of kits returned for analysis. However, within WA where only the supportive media was used, there was a smaller and non-significant increase. The interaction analysis indicated that the increased rate of return in Queensland was not significantly different from that in WA, suggesting that this lower intensity media mix in WA led to an increase in return rates, but this increase was less reliable and smaller in magnitude. Among the 7.0% who tested positive on the FOBT in 2014 and who had a follow-up diagnostic assessment,30 0.7% were ultimately confirmed cancers, 2.4% were suspected cancers, 6.9% were advanced adenomas and 7.1% were non-advanced adenomas and 23.2% were polyps awaiting histopathology. Our results suggest that the Queensland CCA campaign mix that included the paid television advertising component was associated with an extra 1314 (95% CI 663 to 1965) kits being returned per month, meaning that 5256 (95% CI 2652 to 7860) extra kits were returned in Queensland over the 2 campaign months and 2 months postcampaign. Extrapolating these figures, the CCA campaign is estimated to have led directly to an extra 368 (range 186–550) people who tested positive on the FOBT. With around 73.4% of these having follow-up diagnostic assessment (n=270, range 137–404),30 the CCA campaign in Queensland may therefore have led directly to the detection of around an extra 2 (range 1–3) people with confirmed cancer, an extra 6 (range 3–10) with suspected cancer, an extra 19 (range 9–28) people with advanced adenomas, an extra 19 (range 10–29) people with non-advanced adenomas and an extra 63 (32–94) people with polyps awaiting histopathology, in that state alone. It is important to note that this clinically significant result is due to a single 2-month campaign burst in one state and would be magnified if the campaign was rolled out nationally and repeated several times each year. Similar campaigns could lead to fivefold increases in these population effects, given Queensland only accounts for 20% of the Australian population. There is also a cumulative benefit given monitoring records show that 76.9% of these people will do the test again when next invited.31 These findings highlight the importance of widespread population exposure, which is mostly reliably facilitated through paid television advertisement broadcasts combined with other supportive media channels, especially for this older demographic which still consumes many hours of television content.32 It is possible those studies which found little impact of non-televised campaigns21 may have suffered from inadequate population penetration. In addition, this study only examined the effect this campaign had on the NBCSP kit return rates from those who were invited in the current or past 3 months (our offset term). A minority retain the uncompleted test at home for longer than this time period, so kit returns due to the campaign could have been higher. Our offset term was therefore cautious. In Australia, there is a significant proportion of people aged 50–74 who access screening ‘outside’ of the NBCSP, either by purchasing an FOBT from a pharmacy, obtaining a script from their GP for a non-NBCSP FOBT or by colonoscopy.23 Thus, while this campaign may have had a broader effect on bowel cancer screening, the present results are limited to effects only on those recently invited to complete an FOBT through the NBCSP. Finally, the estimated proportions that tested positive and undertook follow-up assessment are based on information reported back by pathology providers to the NBCSP Register. As reporting back to the NBCSP Register is not mandatory, the data are incomplete and may be an under-representation.30 The level of under-reporting is unknown. Therefore, it is possible the number of people who tested positive on the FOBT and who completed follow-up assessment may be higher than the extrapolated numbers described above, meaning the outcomes for those assessed (ie, proportion of confirmed cancers, suspected cancers, adenomas) likely represent an underestimate. The strengths of this research include the use of an objective behavioural outcome to examine the impact of the campaign and statistical adjustment for the number of people who were invited to complete the FOBT kit within the current and past 3 months. Confidence in these findings is also strengthened by adjusting for seasonality and the potential influence of the presence of the other campaigns, as well as testing for the length of effects in the sensitivity analyses. Overall this study suggests that the low levels of participation in the NBCSP may be increased by future national mass media campaigns, especially those led by paid television advertising. Regularly repeated broadcasting of wide-reaching mass media bowel cancer screening campaigns could educate new cohorts about the NBCSP as they age into eligibility, and remind those already eligible about the risks of bowel cancer and the benefits of screening, helping to maximise participation and ultimately prevent many thousands of bowel cancer deaths. We thank the Australian National Bowel Cancer Screening Programme for providing access to FOBT data by state to enable the analysis in this paper and for reviewing the results of this analyses. Australian Institute of Health and Welfare. Cancer in Australia 2017. Canberra, Australia: Australian Institute of Health and Welfare, 2017. Cancer Series no. 101 Cat. No. CAN 100. Department of Health. About bowel screening Canberra, Australia: Australian Government Department of Health. 2014 http://www.cancerscreening.gov.au/internet/screening/publishing.nsf/Content/about-bowel-screening (cited 3 November 207). Department of Health and Ageing. The Australian bowel cancer screening pilot program and beyond: final evaluation report. Canberra: DoHA, 2005. Australian Institute of Health and Welfare. Analysis of bowel cancer outcomes for the National bowel cancer screening program. Canberra, Australia: Australian Institute of Health and Welfare, 2014. Cat. no. CAN 87. Australian Institute of Health and Welfare. National bowel cancer screening program: monitoring report 2018. Canberra, Australia: Australian institute of health and welfare: Cancer Series, 2018. Cat. no CAN 112 Contract No. : ISBN: 978-1-76054-333-4.
. Community approaches to increasing colorectal screening uptake: a review of the methodological quality and strength of current evidence. Cancer Forum 2012;36:27–35.
. Improving awareness and uptake rates in bowel cancer screening across cheshire and merseyside. Evaluation of a bowel cancer screening awareness campaign for cheshire and merseyside public health network. ChaMPs: University of Chester, 2012. Michael Murphy Research. Bowel cancer screening recruitment strategy. Report of qualitative testing of bowel screening television commercials. Melbourne, Australia: Cancer Council Victoria, 2013. 8 November. Report No.
. Evaluation of the 2014 national bowel cancer screening program communication campaign. Melbourne, Australia: Centre for Behavioural Research in Cancer, Cancer Council Victoria, Prepared for: Cancer Council Australia, 2014. Australian Bureau of Statistics. 3101.0 Australian demographic statistics. TABLE 55. Estimated resident population by single year of age, Western Australia. Canberra, Australia: Australian Bureau of Statistics, 2015. Australian Bureau of Statistics. 3101.0 Australian demographic statistics. TABLE 53. Estimated resident population by single year of age, Queensland. Canberra, Australia: Australian Bureau of Statistics, 2015. Australian Institute of Health & Welfare. National bowel cancer screening program monitoring report 2017. Canberra, Australia: Australian Institute of Health and Welfare, 2017. Cancer series no.104. Cat. no. CAN 103. Australian Institute of Health & Welfare. Cancer screening in Australia by small geographic areas 2015-2016. Canberra, Australia: AIHW, 2017. Roy Morgan Research. 1 in 7 Australians now watch no commercial television, nearly half of all broadcasting reaches people 50+, and those with SVOD watch 30 minutes less a day. Melbourne, Australia: Roy Morgan Research, 2016. Press release, 1st February.